Thomas Bach said the "so-called killer games" which promote violence or discrimination cannot be accepted into the Games. "If you have egames where it's about killing somebody, this cannot be brought into line with our Olympic values," he said at the Asian Games. By 2020, it's predicted esports will generate £1bn in global revenue. For the first time, esports is being included as a demonstration event at the Asian Games - which is a traditional sporting championship. 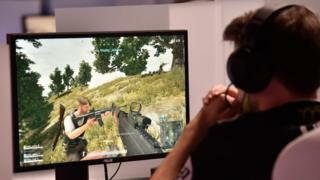 During the Games, organisers expressed sympathy for victims of the deadly shooting at a video games tournament in Florida. Two professional video gamers were shot by a rival player. Both victims were well-known players of the Madden NFL American football game. Esports is no longer considered niche - with a global audience of around 320 million people. And of course, the debate on what actually constitutes a sport goes round and round. But it is being taken seriously. "Of course every combat sport has its origins in a real fight among people. But sport is the civilized expression about this," he said. Zhang Dazhong promotes esports but agrees violence is the hurdle in achieving Olympic status. "It has to fit the spirit and the value of the Olympics. The content should not be violent," he said during the Asian Games. "Blood in video games is the problem. The line to violence can be blurry but when it comes to blood it's easy to define."